The Executive Leadership Development Program (ELDP) has been designed to assist the United States affiliated insular areas and the freely associated states with developing and retaining the qualified, skilled staff that will become the future leaders of their respective governments. Program participants meet four times over the course of a year to develop skills in leadership, management, government finance, procurement, and auditing. The ELDP is designed and managed by the Graduate School's Pacific & Virgin Islands Training Initiative (PITI-VITI), with funding support from the United States Department of the Interior's Office of Insular Affairs. 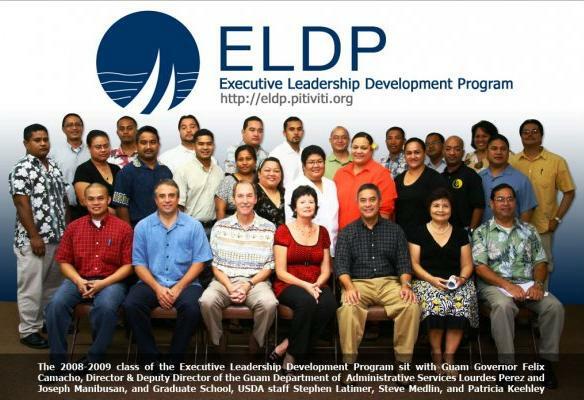 The 2008-2009 ELDP Class was selected in early September 2008, consisting of 23 participants from across the Pacific and Virgin Islands. The application process was rigorous, with many more applicants than available positions. This initial cohort represents the best and brightest aspiring leaders of their respective governments. Participants complete several self-evaluation instruments to determine leadership and managerial strengths. They also develop action plans to address low skill areas and enhance strengths. Participants create action plans for the mentoring experience and projects. They leave the session with a schedule for implementation and timelines for reporting before the next session begins. Participants develop a working knowledge of the government's financial processes. Participants learn how the procurement, accounting, and audit resolution processes must be managed to ensure sound financial management of government resources. Participants learn about the responsibilities and styles of elected and appointed leaders in government organizations. Additionally, participants develop skills in fundamental management tools and techniques such as supervision, communication, and teambuilding. Participants will integrate all of the activities throughout the past 12 months during this session. They will present the results of their major projects and other assignments. Additionally, they will develop personal strategic plans that integrate their training with future career paths.